The Olympic Organizing Committee (VANOC) has invited Indigenous people to participate in the organization of the Vancouver Olympic and Paralympic Games. This partnership is interested : the Olympic Games take place on Indigenous lands and VANOC was fearing an anti-Olympic movement. They prefered collaborating with the First Nations by funding new facilities and educational and cultural projects. The aboriginal artistic influence can be seen in the Olympic logo (which depicts an inukshuk, a pile of stones built by Inuits), in the traditional patterns etched on the Olympic medals and in the opening ceremony that featured Aboriginal dancers. 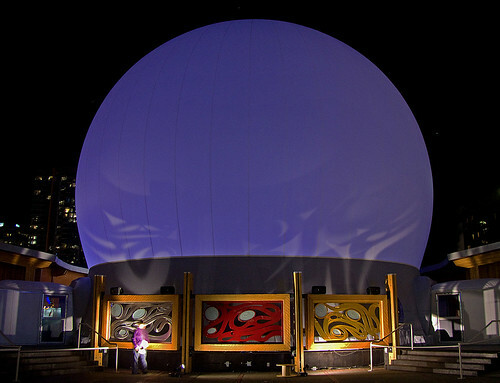 An Aboriginal Pavilion was temporarily located in Downtown to promote the Aboriginal cultures during the Olympic Games. 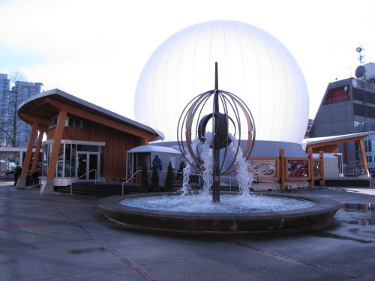 The Aboriginal Pavilion was topped with a dome. A 360° movie was screened inside the dome. It showed images of the First Nations blending past and present, maybe to demonstrate that Aborigines belong to modern society. Other animations were organized such as dance performances. A wood totem pole stood outside the pavilion. Totem poles are a Western Canadian First Nations’ tradition. Made up of stacked figures, a totem pole tells a story. 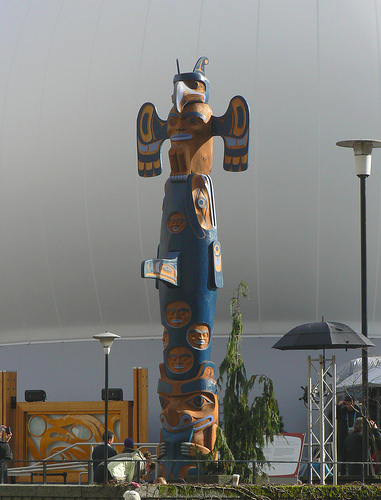 You can recognize on the Pavilion’s totem pole, from top to bottom, a Thunderbird with spread wings, a whale (whose dorsal fin shows up in the middle of the totem pole), four faces representing four races of people and down, a bear. 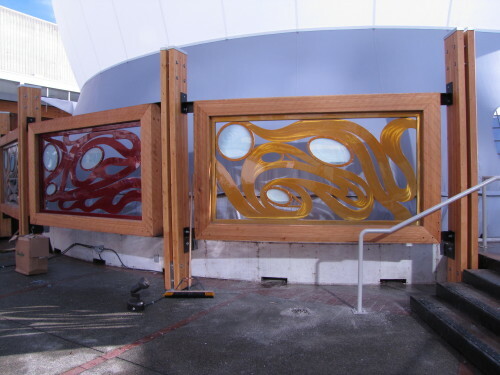 By the Aboriginal Pavilion, steel and glass panels designed by artist Carey Newman combine contemporary materials with patterns inspired by some traditional indigenous motifs. He proves that you can come from a very ancient culture and at the same time be very modern. 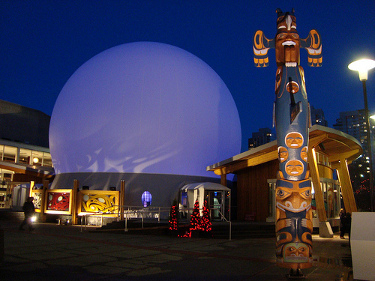 The Aboriginal Pavilion gave a preview of Indigenous peoples’ cultural wealth. Even if it doesn’t change the fact that those peoples have to deal with a lot of problems (alcool, unemployment, high youth suicide rate…), Olympic Games have at least given a positive image of First Nations. This entry was posted in Art and tagged Vancouver by ApollineR. Bookmark the permalink.